Unquestionably one the most infamous of the famous (or is it the other way around) surfers ever, Miklos Sandor Dora, a.k.a. Miki "Da Cat" Dora, a.k.a. "The Black Knight," was one of surfing's most colorful characters. Miki was a study in contrasts, a zen-like smoothness that was anything but Buddhist like when it came to sharing his waves. Railing against the destruction of his beloved lifestyle, he wasn't above receiving a paycheck for being an extra in Hollywood's Beach Blanket Bingo false portrayals of that said lifestyle. Miki was our surfing enigma—loner, world traveler, fugitive, and follower of his own drum—perhaps "Exiled Prince" would be a more fitting title. In 2002, Miki succumbed to his battle with the big "C" at his father's home in Motecito, California. If you ever get the chance, ask Greg Noll about his relationship with Miki and see if the big wave legend doesn't get a little quiet as he shares a tale or two about his good friend. 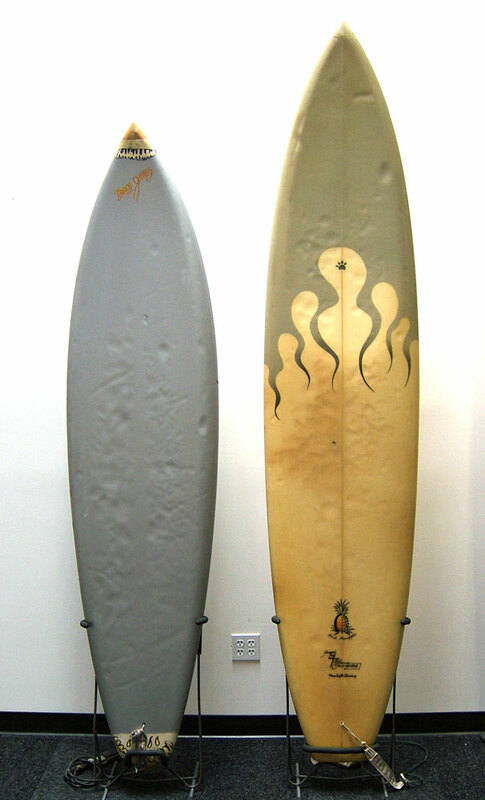 These two boards come to us by way of Miki's ex-girlfriend, Cecilia Clouse, who agreed with Miki's family that the boards should come to the Surfing Heritage Foundation. They look to be circa late '70s-early '80s. One is a 7'7" silver Bruce Jones, and the other is an 8'8" Bill Shrosbree Fresh Pineapple (complete with a black paw logo). Both are single fins and still have the leashes attached. Pretty darn cool.